Waterfall laced mountains and Hanalei Bay views through a tropical prism. These will be your first impressions and lasting memories of this welcoming home. The Hanalei Vista House is an all cedar home built 15 feet off the ground to enhance the spectacular views of Hanalei Bay and the adjacent mountains. A wrap around lanai is positioned to especially enhance opportunities to savor a Napali sunset while enjoying a baroque or glass of wine. Awesome location, away from the crowded resorts/condos. Well stocked! Room for everyone! Light and Bright. Views of mountains and bays. Quiet place to relax in the evenings after our day excursions. Having parking under a carport was IDEAL as we had a jeep and could leave the top down if we needed to at night. Overall just a wonderful place to stay and get away from it all. We loved this home. It was clean, comfortable, and fit our group nicely. My only issue was that it is close enough to the highway that you pick up some early morning traffic sound but otherwise was perfect for us. Thanks, we’ll likely be back again! Jane is a very nice person to deal with and the house is excellent. We loved the view and the laid back feel of the house and garden. I would recommend this place to anyone visiting Kauai. Great house in convenient North Shore location. We prefer to spend most of our time on the North Shore, so this spot was perfect for us. The house was clean and well stocked with towels, kitchen stuff, and even some beach gear. We had sunset views over Hanalei Bay (when it wasn’t stormy). Owner is very responsive, which is appreciated. I would definitely recommend. This beautiful house at all or expectations! This beautiful house met all our expectations! We stayed here for a week with another couple and had such a quiet an enjoyable time there. 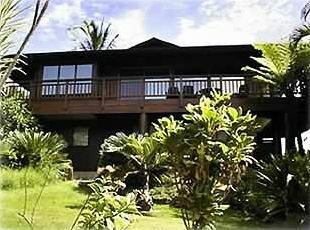 The wraparound lanai is a huge plus! The house is beautiful, well built and is obviously well cared for. We ate in most nights and really enjoyed the compatibility of having the bar for non-cooks to be seated at while the cook was in action! There is road noise, but as other reviewer‘s have indicated, this can be mitigated by conversation and laughter! We walked every day into Princeville for lattes at the market. This was one area of concern for us, as the road is quite narrow and was a little bit daunting. Of course this is not an aspect of our stay that the owner has any control over! If you love the sound of birds, the sight of lush, tropical vegetation (growing before your very eyes! ), and a chance to hang out among the trees, this is the place for you! Beautiful house with all the amenities for a lovely stay away from home. The rooms were generous, with views over the bay and enough space for larger gatherings with spill-out onto the wrap-around verandah.